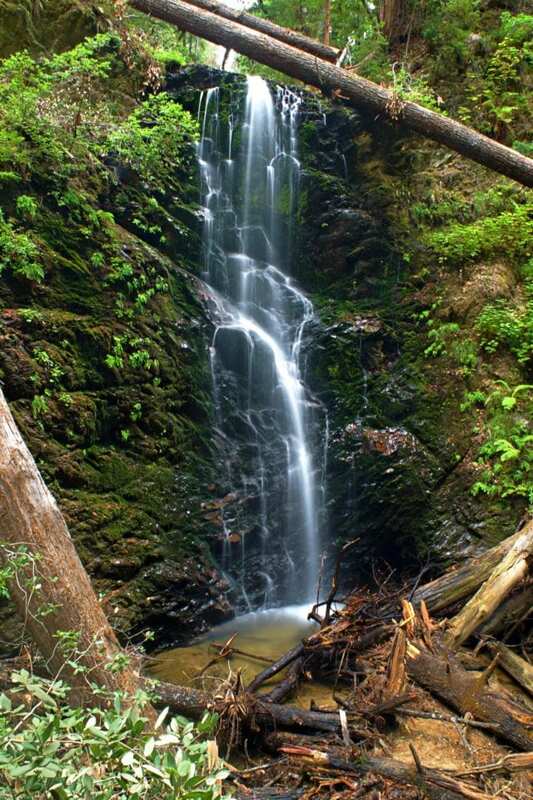 Berry Falls is the premier hike of Big Basin Redwoods State Park in California. They even have commemorative stickers for sale in the gift shop that says “I Made It! – Berry Falls”. In part, the notoriety is because it’s a difficult but manageable hike. 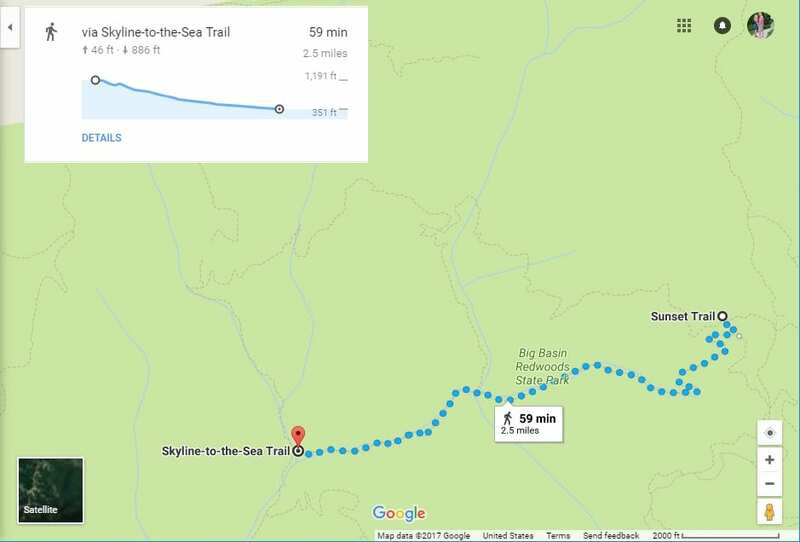 It’s labeled as a strenuous 10.5 mile loop with 2,364’ of elevation gain. 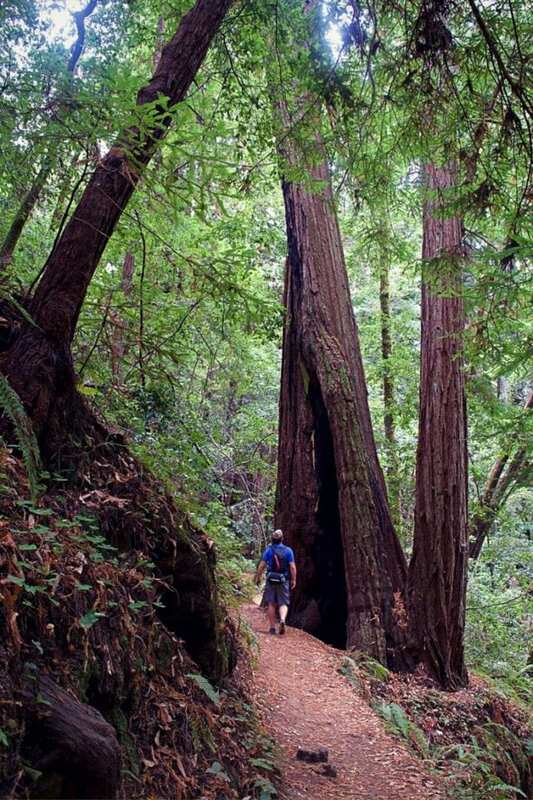 If you’re going to take one hike in the redwoods south of San Francisco, this is the hike. 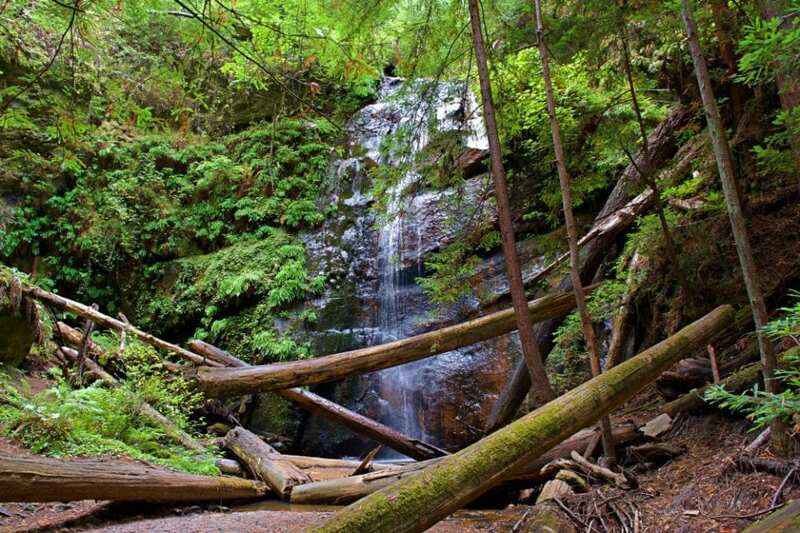 You’ll see the largest old growth redwoods and the spectacular Berry Falls. 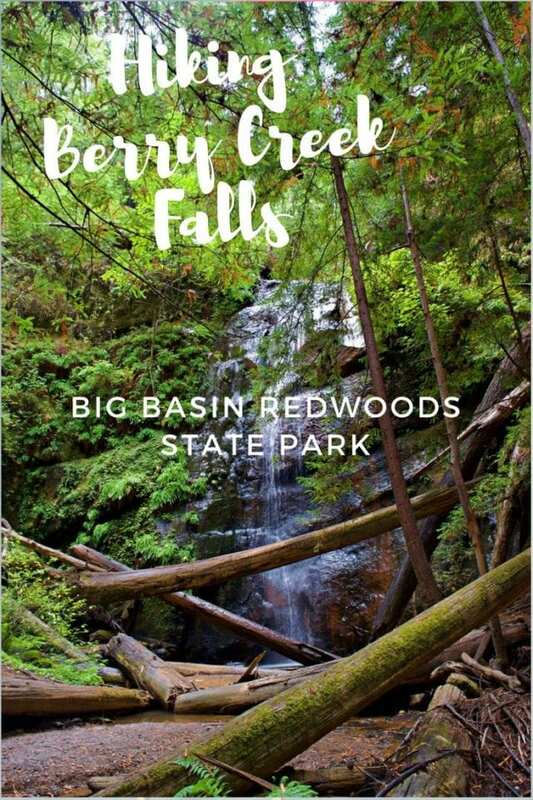 Keep reading to learn more about Hiking Berry Falls Loop, Background on Big Basin Redwoods SP, and the breathtaking images from the hike. Over a century ago, Carrie Stevens Walter of the Sempervirens Club had an amazing astute prophecy about why Big Basin Redwoods and Berry Creek needed protection – “Imagine a time when the whole peninsula from San Francisco to San Jose shall become one great city; then picture, at its very doorstep, this magnificent domain of redwood forests and running streams, the breathing place of millions of cramped and crowded denizens of the city.” That was 1901. 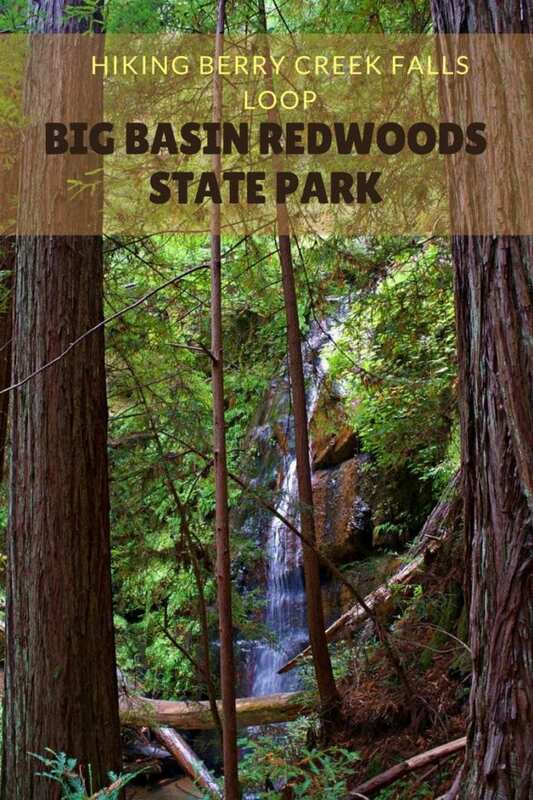 In 1902, Big Basin Redwoods State Park was established as the first California State Park. 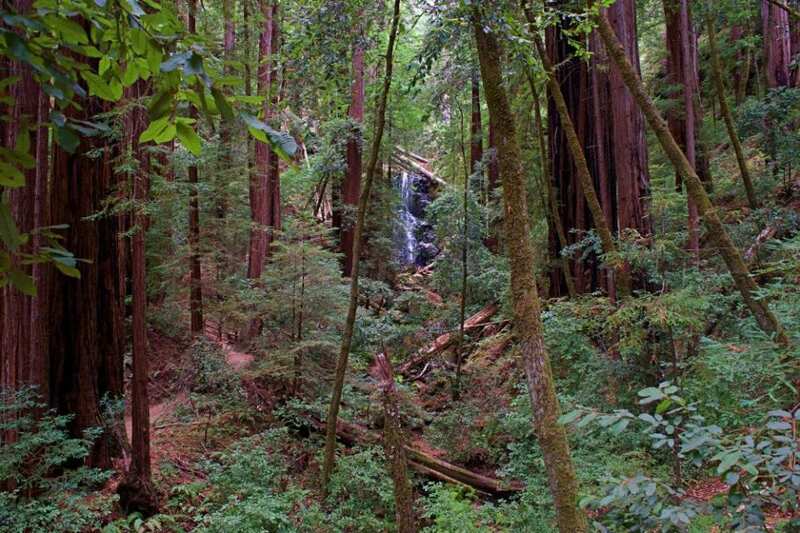 The City by the Bay did fill in between San Francisco to San Jose and beyond and this ancient forest is still protected. It sits just 60 miles south of San Francisco, 30 miles west of San Jose, and 20 miles north of Santa Cruz. The deep forest and the proximity to town makes it the perfect choice for parks to visit if you want a challenging hiking adventure. 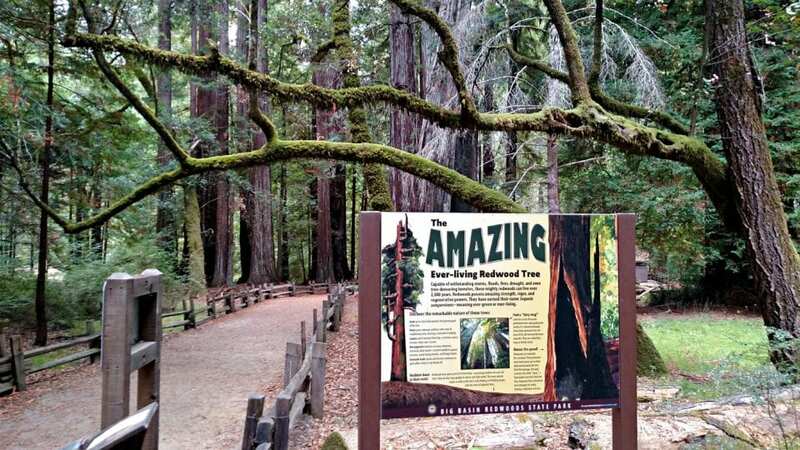 It’s a great complement to a visit to Santa Cruz or the epic road trip along the Big Sur Coast. 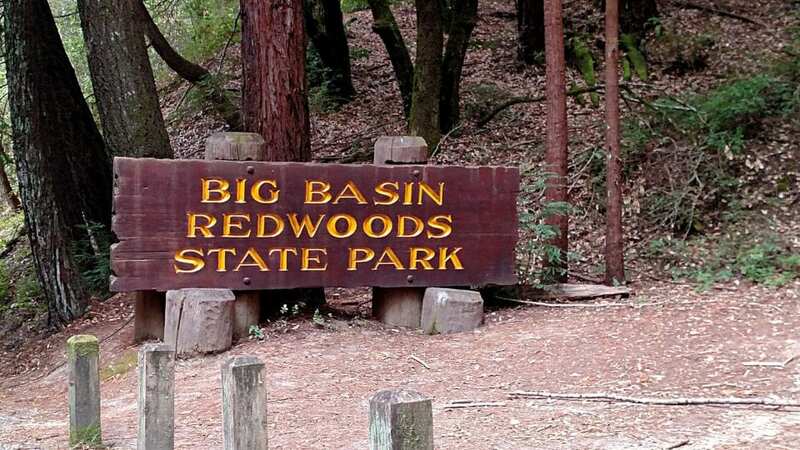 Big Basin contains the largest continuous stand of Redwoods south of San Francisco, with giant trees over 50’ in diameter that have been around since before the Roman Empire. 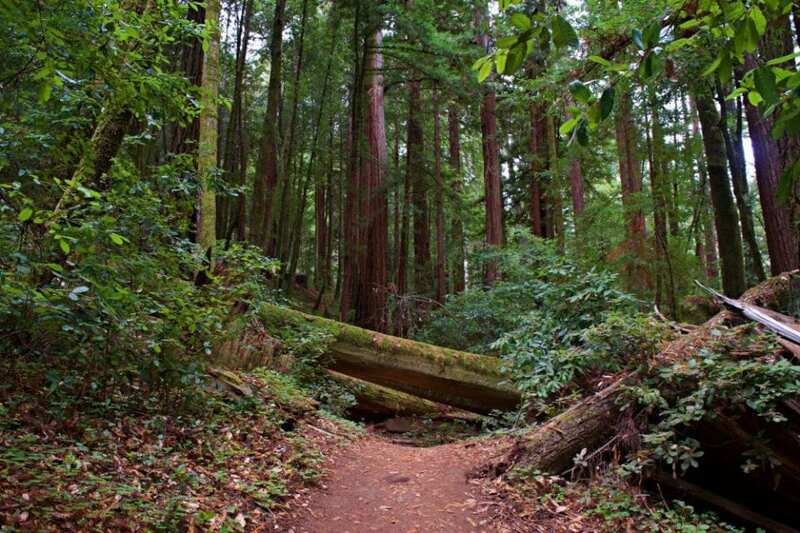 Within the park, there is camping in the redwoods and over 80 miles of hiking trails. 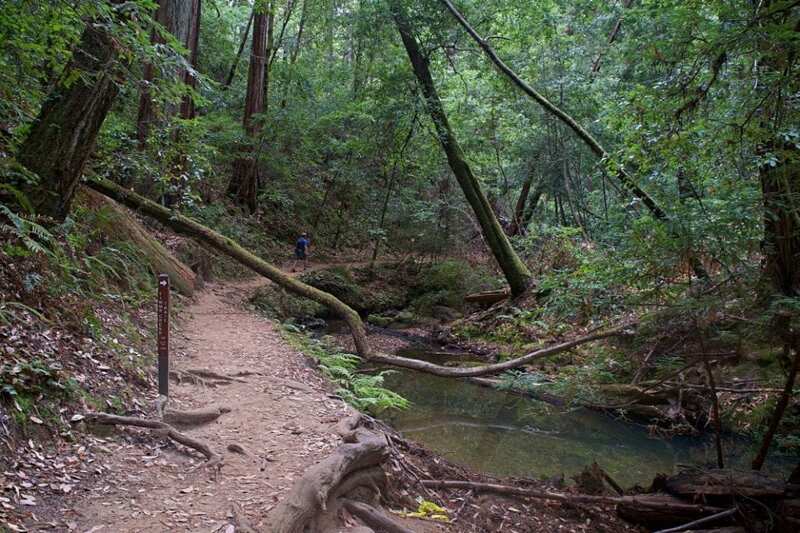 The trails vary in length from the ½ mile Redwood Trail where you can see the Mother of the Forest Tree that’s almost 300’ tall to the massive Skyline to Sea trail that goes 12.5 miles down from the Redwood Forest to the Pacific Ocean and that’s not even including the return trip. 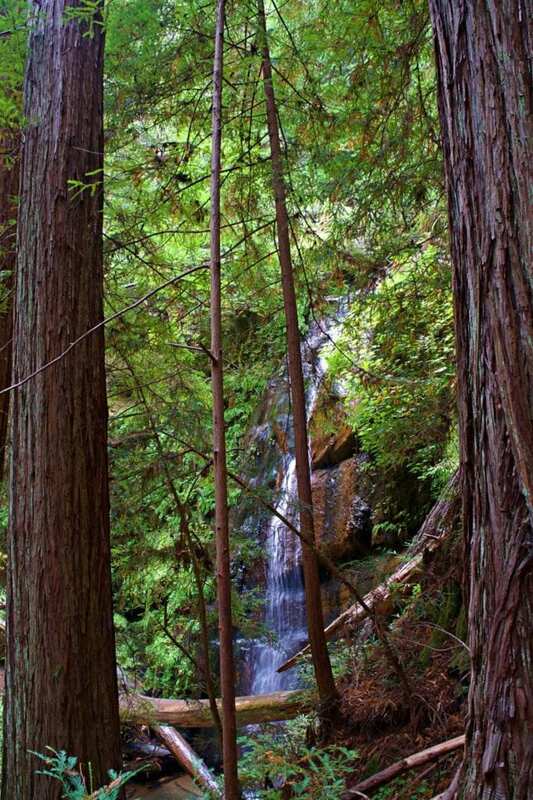 We chose to hike the Berry Creek Falls Trail so we could see both the redwoods and waterfalls. We hiked Berry Creek Falls in mid September. 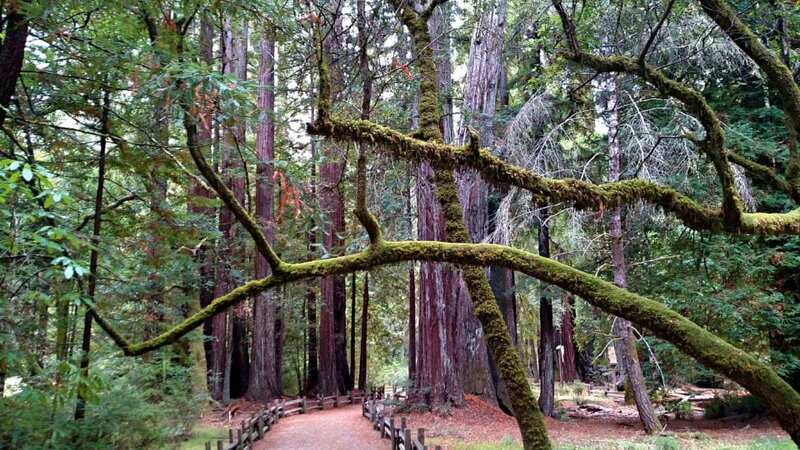 We left Santa Cruz drenched in sunshine and pulled into a hazy, soft rain at Big Basin Park. When we checked in with the ranger about the weather, she said that the weather report said zero chance of precipitation with a sly smile. Then she handed us our trail map and highlighted the trails that were closed from heavy rain washing out bridges. She also gave us an information sheet for our car so we could mark our departure time (10:00) and our destination (Berry Creek Falls) so the Rangers could find us if need be. Then she gave us quick directions to the trailhead across the street and we were off. We filled our water bottles at headquarters and were ready to go. 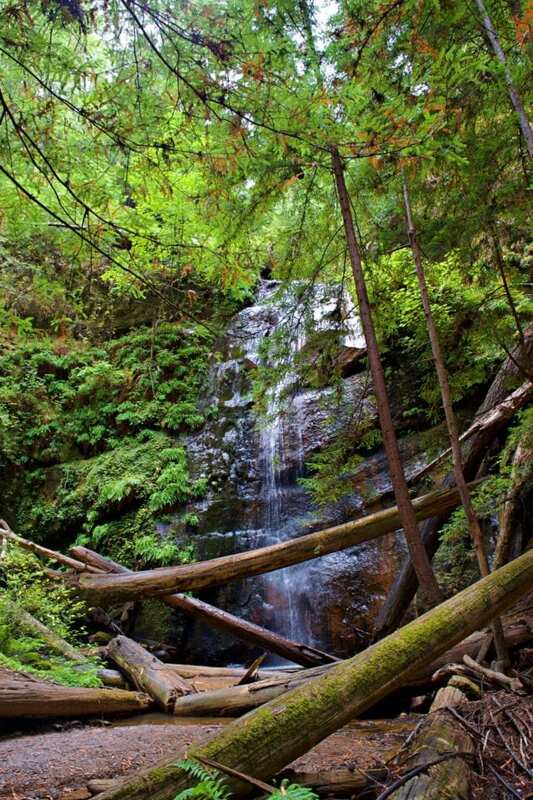 Berry Creek Falls is the type of trail that Rangers have to be careful with. The trail goes primarily downhill, so it is harder coming out than in. You are also hiking in deep forest that gets very dark at twilight. There are several incidents with lost hikers every year so they emphasize self reliance like food, lights and, warm clothes. We slipped our fleece into the daypack and figured our cell phones had the flashlight app to cover the rest. 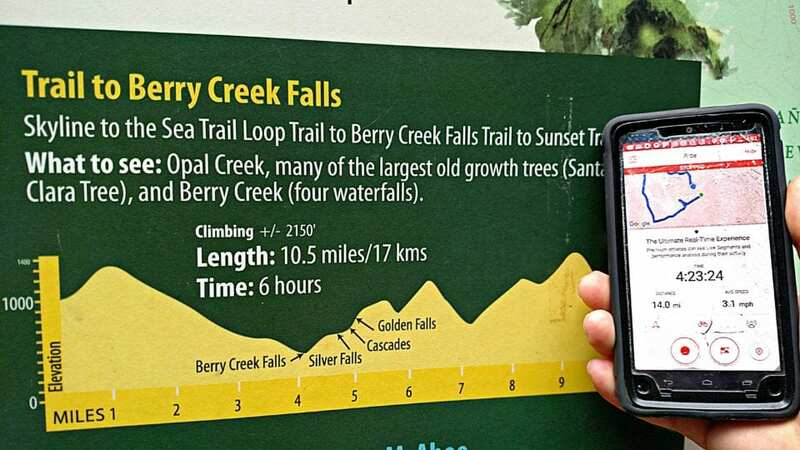 The funny thing is, with all of the precautions and warnings about Berry Creek Falls, the marked trail distance and elevation was considerably off between our GPS and the signage. The sign at the parking lot said 10.5 miles, 2150’ elevation gain. Our GPS registered 14 miles and almost 3000’ of gain. I think this discrepancy was caused by the GPS losing signal in the deep valleys. Our track showed a lot of wandering that we just didn’t do. 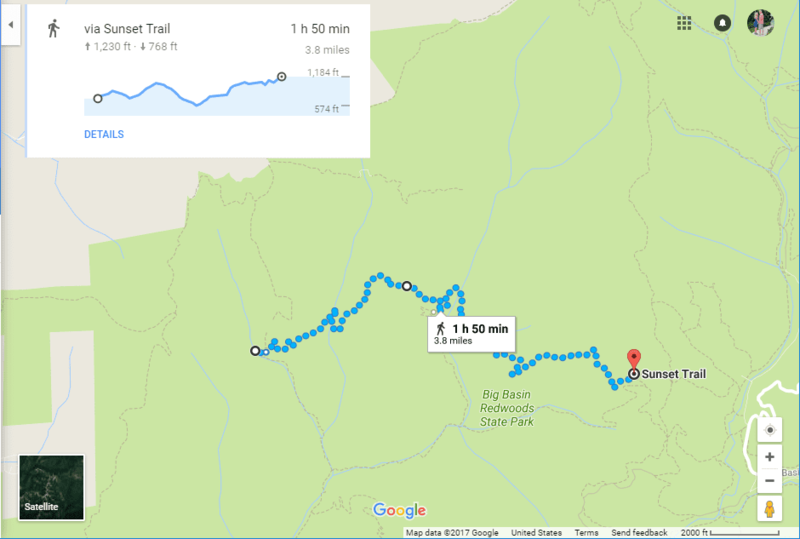 For the purpose of this article, I am recreating the track via Google Maps to get the most accurate trail distance. Just remember to periodically check your reported distance traveled with your trail guide so you have an accurate distance remaining. 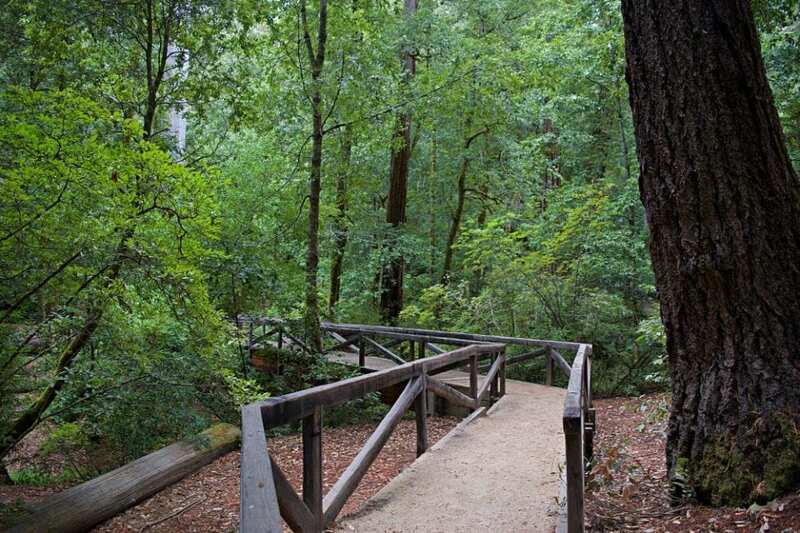 We started off on the Redwood Trail that was wide, gentle and inviting. Moss covered branches swept across the trail. We crossed Opal Creek on a big wooden bridge and made our first turn onto the Skyline to the Sea Trail. We turned right because the trail was washed out to the left. We traveled a short way along Opal Creek, past a Marbled Murrelet nesting area and turned again on the Dool Trail. Marbled Murrelets are a peculiar seabird that travels inland to nest in redwood forests. They need extra protection from scavenging birds, like jays, whose population has been exploding from eating the crumbs from park visitors. 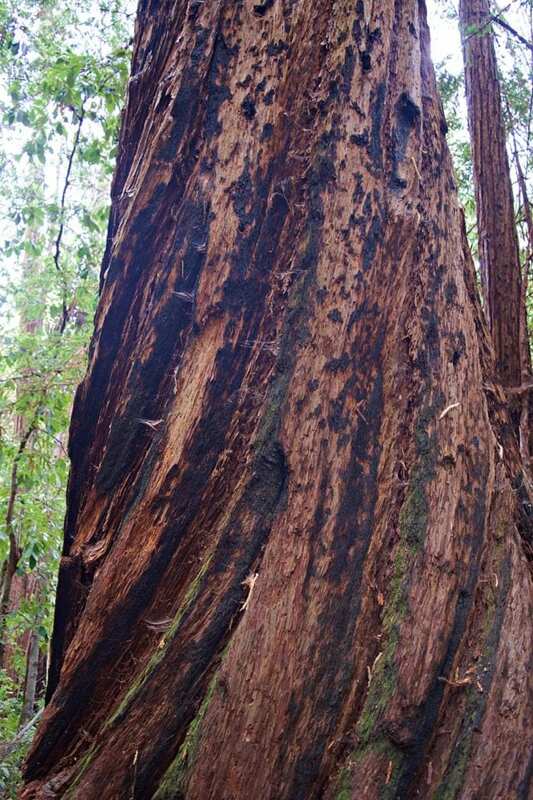 That’s why Big Basin Park is a crumb free zone to minimize the human impact on this unique ecosystem. The Dool Trail quickly connects with the Sunset Trail which we followed up hill to a major junction with the Middle Ridge Road. From there, is was a short downhill to the Skyline to Sea Connector. Another alternative is to take the Skyline to Sea Trail (if it was open) one way and Dool / Sunset the other way to have zero overlap on the loop. 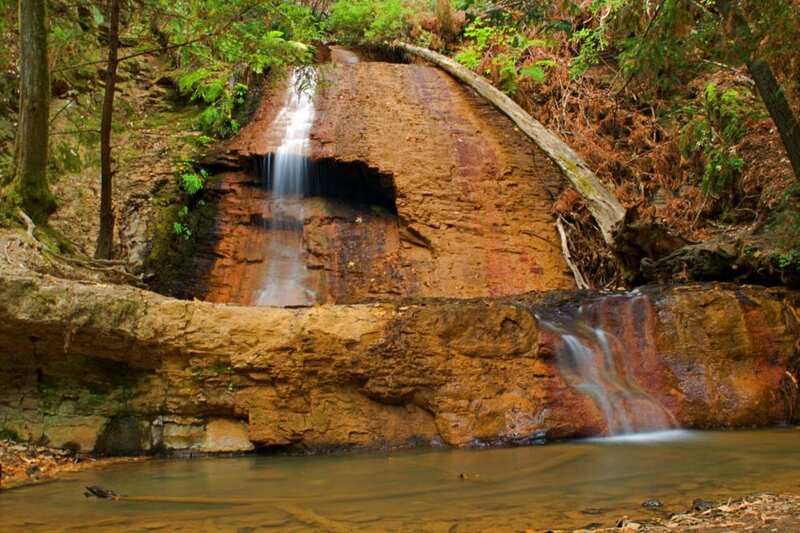 There are various opinions on how to hike the Berry Falls Loop but only two choices, clockwise or counter-clockwise. We choose clockwise so we could look up the falls and navigate uphill on the notoriously slick sections of Berry Creek Trail. We were very happy with that choice but we could imagine in the heat of the summer the exposed sections of the Sunset Trail could get a little hot in the afternoon. But we’re getting ahead of ourselves. We took the Skyline to Sea Connector and quickly got on the Skyline to Sea Trail. 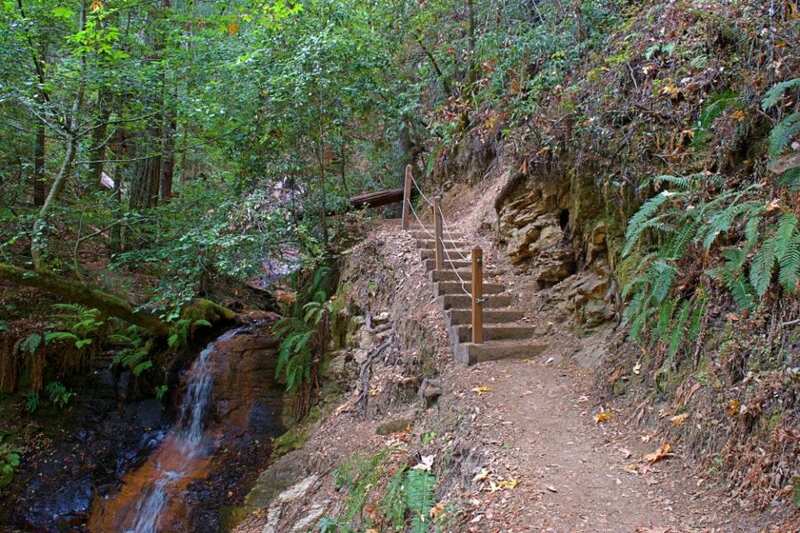 For the first .7 miles, the trail drops rapidly (about 330’) into a deep valley where you reach Kelly Creek. From there, you walk along the creek bed for another mile (-370’) and you reach the junction with Waddle Creek and the Timm’s Creek Trail Junction (closed when we were hiking). 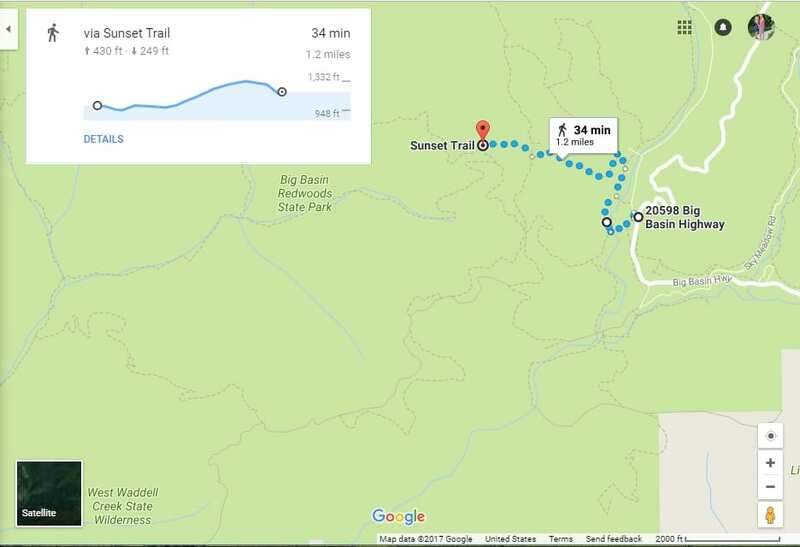 From there, the trail flattens out considerably and you continue for about a mile until you reach Berry Creek Falls and the junction with the Berry Creek Trail. This section of trail goes through dense, old forest and follows a babbling stream the entire time. 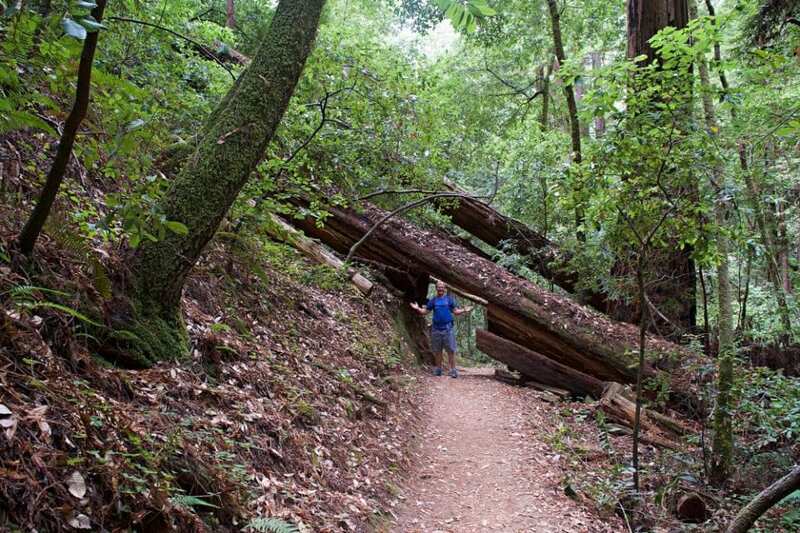 You can see how hard the Rangers work to maintain this trail through the fallen trees. Sometimes, they just cut through smaller trees on the trail, but the larger trees require a chainsawed tunnel to be cut through them. 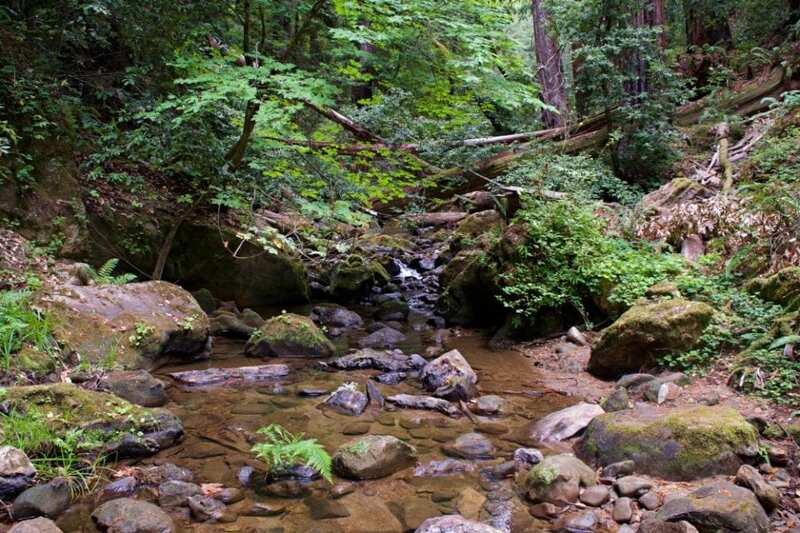 This is the raw, primeval forest that beckons you to come and explore Big Basin Redwoods. Berry Creek Trail is less than a mile long and gets to be the namesake of the entire hike. Why? Because it’s just that cool. 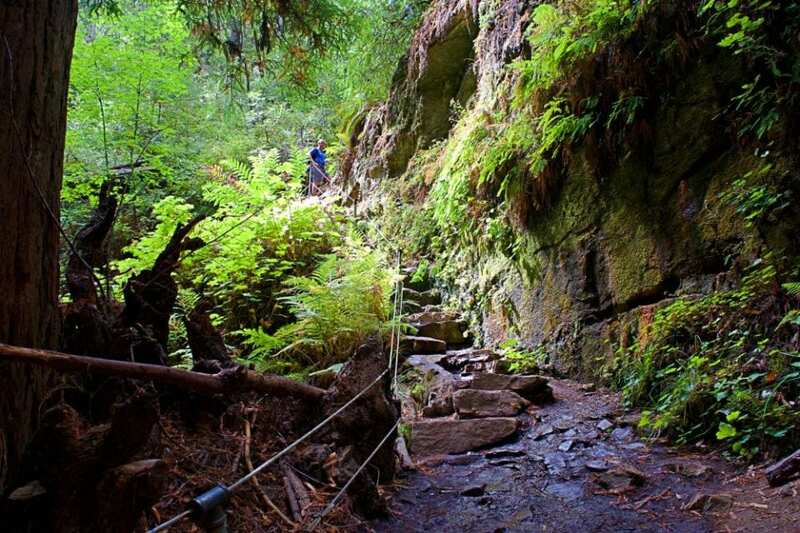 Through this entire section, you are hiking alongside one gorgeous waterfall after another. It’s by far the steepest section of trail with some exposed slick rocks so we were very happy hiking up it for better footing. 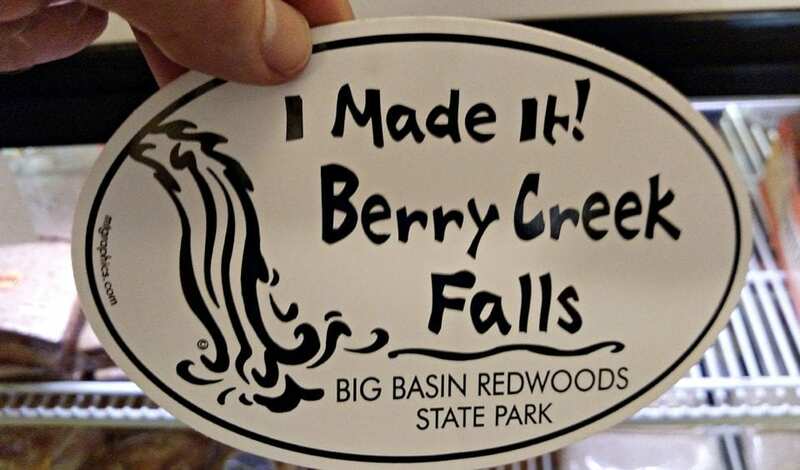 You see Berry Falls first, even before you turn onto the Berry Falls Trail. After a minute or two of walking, you reach the observation platform. We went on a Monday afternoon after the summer crowds had left so we had the place to ourselves. We have heard that this is one of the busiest places in the park on a summer weekend. A well formed trail leads up past the Berry Falls to the next falls in the sequence. There seems to be a little discrepancy between the Google Map names, names on the park map, and names of the falls from other posts on the internet. We are going with park map names which shows the falls in order from Berry Falls, Silver Falls, Cascades, and finally Golden Falls. Given that, we reached Silver Falls next. These falls had a big drop and a little beach at the bottom. Steps were carved out the rocks that led up trail right along the falls. The next falls in the sequence were Cascades. 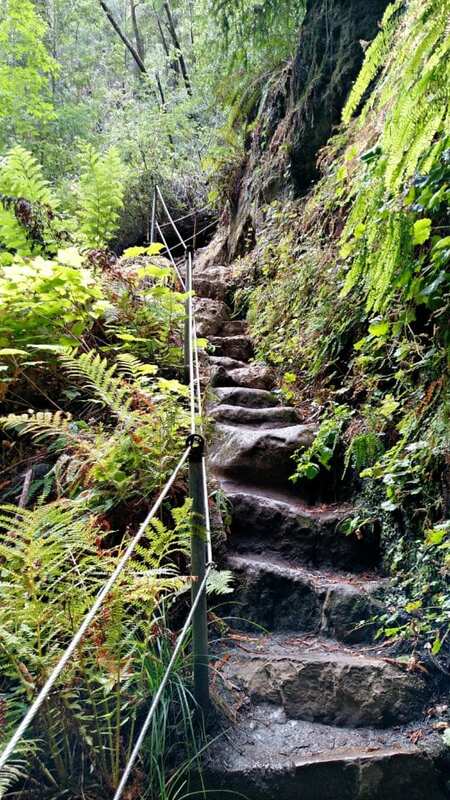 They cascaded gently along a much nicer staircase than Silver Falls. The final falls of the series are Golden Falls. They remind me of a brimstone waterfall in a cave with the way the water trickles down the rock dome. There was a perfectly placed log at the base for long exposure photographs like we took in Cloudland Canyon with our polarizing filter. From here, you have a choice. 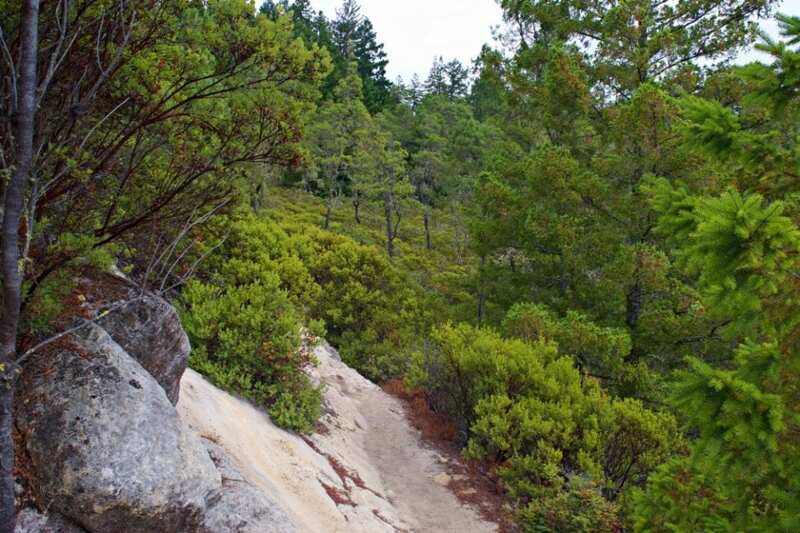 You can backtrack along the two most beautiful sections of the trail, the falls and the deep forest on Skyline to Sea, or you can climb out of the creek and take the Sunset Trail across the ridge. I would completely understand if you wanted to hike the money sections of trail again. It’s actually a little shorter to head back and less climbing too. But we have a little fomo and love exploring new trails so we opted to close the loop and take the Sunset Trail Back. Did you notice the omitted item from our hiking prep list – food! We were playing the trail game what would Bear Grylls eat. Of course, we didn’t harvest any plants from the forest but it did distract us from that fact that this trail undulated through four different streambeds. In fact, we went down over 700’ into these stream beds just to climb back out of them again. There was also the fact that our GPS errors were accumulating and saying we should have been at the car already before we joined up with the Skyline to Sea Connector. Maybe we would have been less grumpy if we hiked the route counterclockwise and did this section before we got tired. Maybe we should have just brought a ham sandwich. To be fair, there were some unique sections of forest here where the mosses covered the branches. You could tell that we were in a different microclimate. The bridges over the creeks were also particularly photogenic. We saw our first banana slugs here and there were some redwoods of extraordinary size. If we weren’t completely spoiled by the primeval forest along the creek bed and waterfalls, we would have really enjoyed this section. We retraced our steps back from the Skyline to Sea Connector to Park Headquarters. 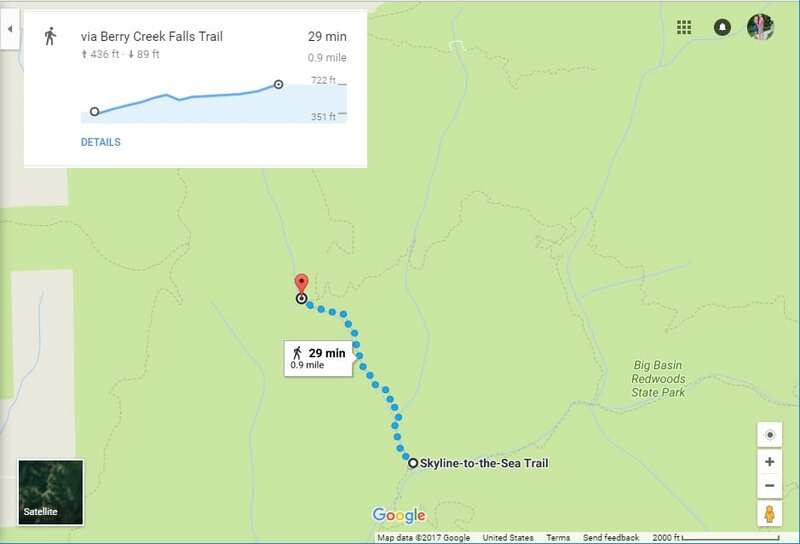 You can see from the map that we crossed Opal Creek a little earlier and came out at the camp store where we had a decent latte and some soft serve ice cream. That latte and soft serve ice cream were way better than anything Bear would have had us eating out there. The Berry Creek Falls loop is no joke. The trail is in excellent condition with plentiful shade but you need to plan for the six hours they say this hike takes. The elevation gain is real and the park store sells ham sandwiches if you forgot to bring one from town (softserve just wouldn’t do in your pack). 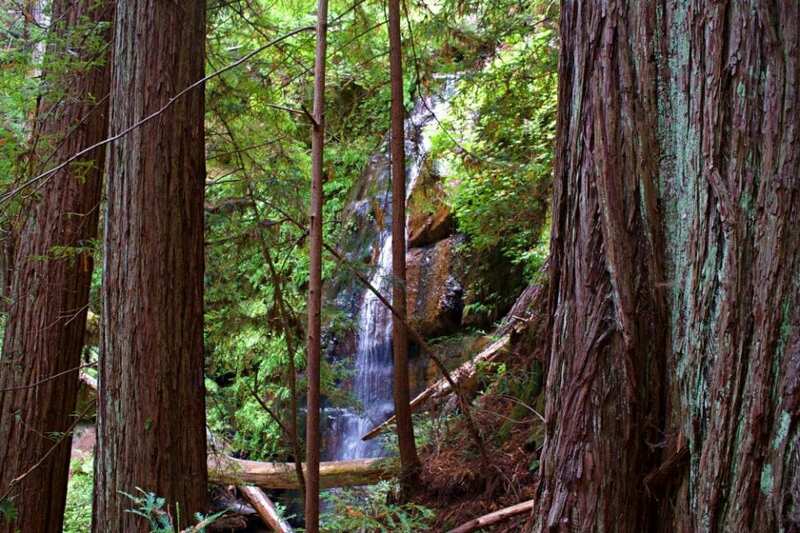 What makes this trail special is that you hike through real, old growth redwoods and see waterfalls. There are few places on Earth where you can do both on the same hike.